New. 0241979331 Soft Cover Brand new Unread Book. Good. 0374500010 Some wear, but still a good reading copy. A portion of your purchase of this book will be donated to non-profit organizations. Over 1, 000, 000 satisfied customers since 1997! We ship daily M-F. Choose expedited shipping (if available) for much faster delivery. Delivery confirmation on all US orders. Very Good. 0374500010 Has moderate shelf and/or corner wear. Great used condition. Over 1, 000, 000 satisfied customers since 1997! We ship daily M-F. Choose expedited shipping (if available) for much faster delivery. Delivery confirmation on all US orders. Like New. Light shelf wear and/or a remainder mark. Complete. Clean pages. Good. 0374500010 Some wear, but still a good reading copy. Over 1, 000, 000 satisfied customers since 1997! We ship daily M-F. Choose expedited shipping (if available) for much faster delivery. Delivery confirmation on all US orders. It was not quite what I had expected. It was a translation by his wife and it presented a more bland picture than it probably really was. Of course, that's a very difficult subject to write about as a first-person experience. Powerful book with straight forward telling of incomprehensible torture and pain. What the author and his father endured tears at the heart and touches fear in one's own self. A repeat of this terrible nightmare is not impossible and quite possible in today's world situation. I found myself holding my breath many times when author was speaking of his father. It was almost agony to find out if his father survives or not. 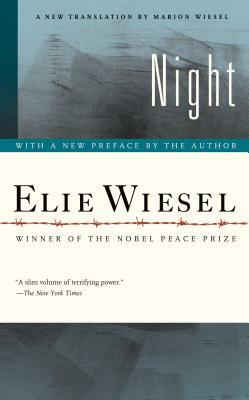 Elise Wiesel is a writer in the purest sense...he wrote what he knew about and presented it in honest and forthright manner and touched a responsive cord in in my heart. A very important read for those who ponder what is in store for us as a world if we allow erosion of freedom. A short but powerful story. One can almost feel the exhaustion of the main character and his father as they are herded around like animals. Very tragic about his younger sister and mother since they were segregated from the males and never seen again. A writing that reminds all of us that man vs. man is the worst possible scenario to witness through the retrospective writings of those that were there. A powerful prescriptive about how not to treat human beings.